Well I didn't go far today. 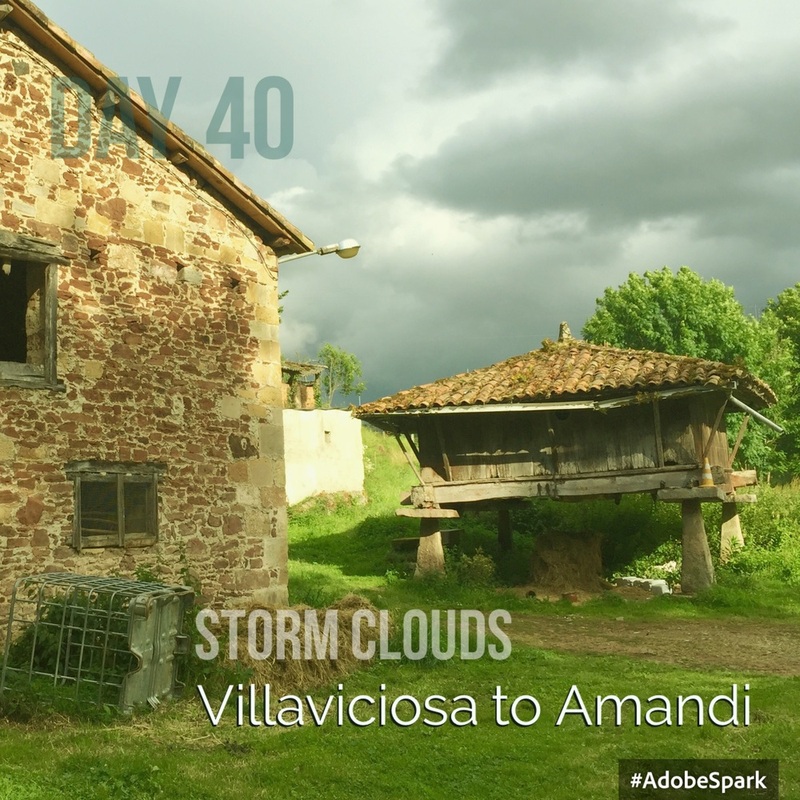 I shaved 35 minutes off tomorrow's journey by walking to the village of Amandi just outside Villaviciosa. On the way I stopped at the Romanesque church of San Juan de Amandi. It has a superb porch with beaked-heads similar to those I saw at Iffley church in Oxfordshire in April! Now I wonder if a Spanish mason was responsible. If last night was a customised albergue, tonight is definitely not. I'm staying in an old cowshed with chickens wandering about, a collie-dog, a cat that's caught an ominously large mouse and lots of flies- but it's charming and the hospitalero is generous. Clothes washing and drying is part of the service and three Italian men and I are drinking his red wine at 4.30pm. The rain eventually stopped at 2pm and now I'm sitting in the garden writing. There are Germans, a Canadian mother and daughter and Italian pilgrims here and we're all preparing ourselves for a hard walk in the rain tomorrow. Some will shortly peel off onto the Camino Primativo route via Oviedo but I'm walking to Gijon. Supper is served at 8pm at a long table with 12 of us. The hospitalero and his Swiss helper eat with us. He explains that he was called to this work (it takes a certain sort of person). He opened the albergue here (with his wife and family) because of the distance and terrain of tomorrow's walk, in September last year. It runs on a donativo (donation) basis and he's had 700 pilgrims pass through so far! Lovely evening. By 9.45pm I've rolled out the bed-bug sheet and sleeping bag. There are two elderly Italian men sleeping literally next to me; it's going to be a noisy and somewhat intimate night.